Canyon Dave's Private Tours are just you and your friends and family. The full day Ultimate Private Tour is $1,500 plus tax. Include up to 14 people (9-12 are more comfortable). Full day private tours pick up in any hotel or local town including Sedona. We can customize a private tour any way you like. 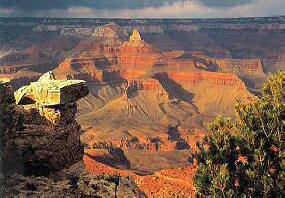 The Private Ultimate Grand Canyon Tour can be just like the open Ultimate Tour, but it is restricted to your party only. While you can change anything you like, the tour usually includes our favorite stops along the rim, with an ecotour style introduction to the geology and wildlife. Next we're off to Navajolands for lunch (included) in a great restaurant, followed by secret stops in a nearby section of the Painted Desert. Here we can visit a place where ancient petrified wood abounds, and the area is truly private. Then it's back to the Grand Canyon for final stops and lengthening shadows. The price includes restaurant lunch, park entry, snacks, and beverages. Pickup is at any time you like, at your convenience. Regular start time is 9:30 AM from Tusayan or Grand Canyon Village, 8:00 from Flagstaff, 8:30 Williams, 7:30 Sedona. We also have private walking tours, private birding tours, private photography tours, and custom tours from any nearby town. If you book your Private Tour online, email us to tell which options or modifications you wish. Any of these tours can be your Charter Tour, and you may modify them as you wish by email or telephone. Tauck World Discovery listed Canyon Dave as "Best of the best." To reserve your tour, call a Canyon Dave tour specialist today! He is loaded with Grand Canyon information and has the best bookings and prices.